There once was a time when vegetable gardening and backyard farming were not endangered; these activities were a way of life. However, with booming big agriculture business comes the need for monetary and job security, which means that threatening the productivity of big agriculture will not be tolerated. 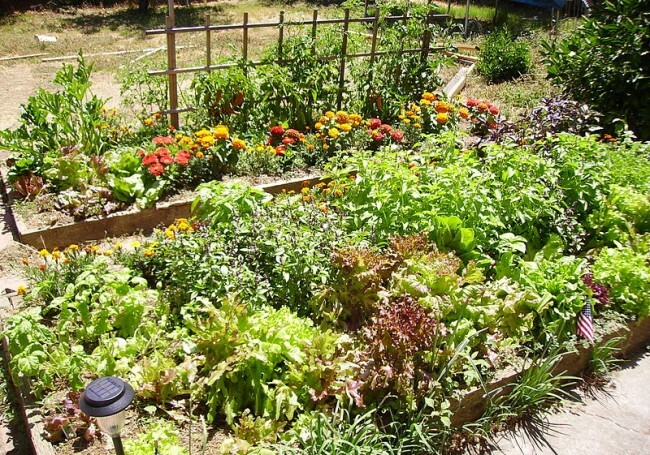 With Michigan’s recent ban on backyard farming, along with many states regulating the amount of garden space individuals may have in their yard, the ability for Americans to grow their own food and feed themselves is becoming a thing of the past. The future of personal gardening and farming is in danger and may become illegal altogether. Michigan recently announced that it has made changes to its Right to Farm Act, which allowed home owners to keep a small amount of livestock on their property without being considered a nuisance, as long as the rules of the Act were followed. Chickens, beehives and goats will officially no longer be tolerated on the properties of urban and suburban farmers, due to the protection of the Right to Farm Act being lifted from small home farmers. Some Michigan farmers believe this new ruling is in place because large producers do not want individuals to provide for themselves or their families; the believed goal is to ensure all are dependent on grocers and mass producers. Individuals often find solace in visiting local farmers’ markets to pick up fresh eggs from humanely raised, healthy chickens and meat from organic, locally raised animals. Many farms which this ban applies to supply local co-ops with high quality meat and eggs; the farmers rely on this business to sustain their families and lifestyles. However, just because Michigan has adopted this ban does not mean every government feels compelled to negate local farmers. In fact, Indiana just passed a bill, Senate Bill 179, which will allot funding to small farm research in order to build up local economies. The alternative to purchasing from local growers and animal farmers is to buy from large producers, or personally grow or raise animals. Because this ban in Michigan applies to small backyard farmers and those on a slightly larger scale who provide co-ops and markets, the only option left is to purchase from large producers. A serious issue with purchasing from large producers is the neglect of animal well-being and product quality that is common within the big agriculture business. Factory farming, or massive farming and intense production of animals and animal products pollutes waterways and is responsible for millions of food-borne illnesses annually. These operations pollute the world’s oceans, contaminating fish and other marine life. Many critics of factory farms argue that these operations should be made illegal, not personal farming and gardening. Front-yard gardening has received backlash as well for many years. Iowa, Florida and Louisiana are among states whose government believes that a green, manicured lawn is much more appealing than growing vegetables or fruits. Des Moines, Iowa, has had recurring discussions about whether to allow for front-yard gardening. The issue is the aesthetic qualities of growing food vs. a green lawn. In Florida a front-yard gardening couple was told to take out their garden or face hefty fines. The fight to grow food and raise animals is becoming a war, though progress seems to be regressing. The right for people to solely provide for their families is an issue that is not going to be resolved any time soon. While big agriculture fights to supply every American with often low quality animal products, individuals fight to provide healthier alternatives and attempt to avoid supporting inhumane animal operations. Those who believe in their right to grow their own food and raise their own animals will not give up the fight. In the meantime, supporting local producers by frequenting farmers’ markets and co-ops is an excellent way to ensure these small-time farmers have a chance of survival. Many individuals do not want to see personal gardening and farming become illegal; with the help of communities they will have a chance. 31 Responses to "Personal Gardening and Farming Are Becoming Illegal"
I carry on listening to the news bulletin talk about getting free online grant applications so I have been looking around for the best site to get one. Could you advise me please, where could i find some? this is a TRUE shame! how dare they take away the right to grow your own food! that is pathetic! I can see that animal farming would be undesirable in a city. The animals would be cramped and the neighbours would rightly dislike the smell. How would anyone know if people grew a few carrots and cabbages ? I can’t believe that that is illegal. Do away with local, state and real estate taxes and maybe folks could afford to buy from big Ag. Small home gardens help families fray rising costs of food so they can afford to pay for these high taxes. Government wants it their way, always!!!!! People have the right to feed themselves as they see fit period. Under law of the constitution any person, persons of government entity, corporation or otherwise who attempts to separate or alienate any persons from their constituents are committing crimes of communism against the people of this free republic. The constitution and the United States of America which is also illegal under the Fair Trade Act. Constitutionally these people persons representatives of mentioned and unmentioned entities are committing crimes of war against the people of the United States of America, and should be taken directly to execution. No trial necessary”They obviously don’t believe in it” This is the Right of the People! Power to the People. If you own your land you should be able to reap the benefits of what you sow and rejoice in the fruits of your labor, front or back or side of your property it should’t matter. It should be up to you and discussed with your neighbors if it’s anything extreme. But a Family Garden! There should be NO law anywhere saying that you can’t grow a family garden on your own land. We work hard all our lives to be able to own a piece of land and when we get it, we can’t provide fresh fruits and vegetables for our family?! That’s just ridiculous, controlling and an infringement upon our rights as land owners. Well I am even more pleased that I live in New Zealand. So am I 🙂 We don’t make the great parade that Americans make about being the land of the free and so on-but we seem to have a lot more freedom in many ways. While what you say about Americans and the great parade is true, do not get too comfortable or trusting of your own government. all governments eventually turn on the people it is simply a matter of time – Australia and New Zealand will be no different in the end; to think otherwise is to ignore the lessons of history. The Australian government has already turned against the Australian people. For example, when it stole their privately owned firearms. It was a gun amnesty, and the guns were paid for. Why are Australians stupid enough to vote these people in, if that’s the case ? I would, however, have reservations about ‘backyard farming’ when it involves animals (who need a lot of space)-I would be in favour of some sort of regulations about their welfare in a small back yard. I would imagine that the neighbours might not like having overcrowded animals making noise and smells and not being looked after properly as the owner doesn’t know how to do this. But if I choose to plant out my entire section, that’s my business.